Once you've mastered the basics, learn how to work even faster and more efficiently in Front. Are replies from different customers being threaded together, or is it hard to tell what part of a chat conversation a tag is referring to? 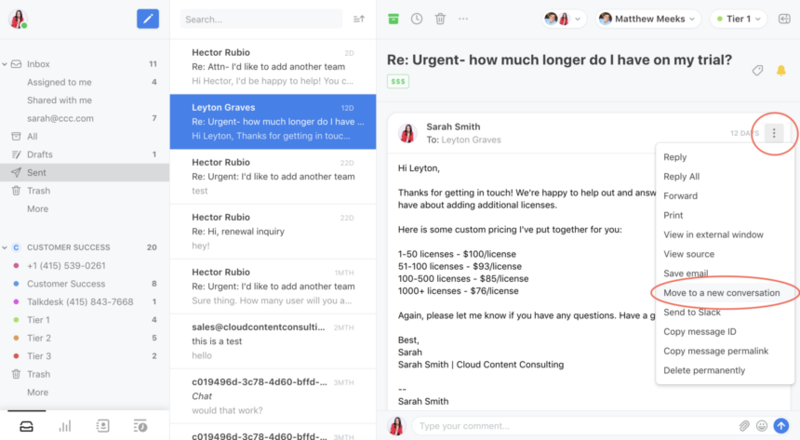 Anyone on your Front team can move an email message into a new conversation or split a text/chat conversation, so you can handle them separately. Replies will thread in the latest conversation, and each conversation will have its own tags and assignee. This works differently for email conversations and other types of conversations like SMS, Front Chat, Facebook, Intercom, and Smooch. Follow the instructions for your conversation type below. Open a conversation you want to split, and click on the message you want to use to start the new conversation. This must be a single message — you can’t select multiple messages and move them as a group. Any messages after the message you select will remain in the original conversation. Click the message options menu and select Move to new conversation in the dropdown. Click Move when it asks you to confirm the move. This action cannot be undone, though you can use our merge feature to combine the threads later. You will land in the new conversation with the single message you selected in Step 1. There will be an activity line in the new conversation linking to the original thread. There will also be an activity line in the original conversation linking to the new conversation. Reply from the new conversation if you would like replies to be threaded there. 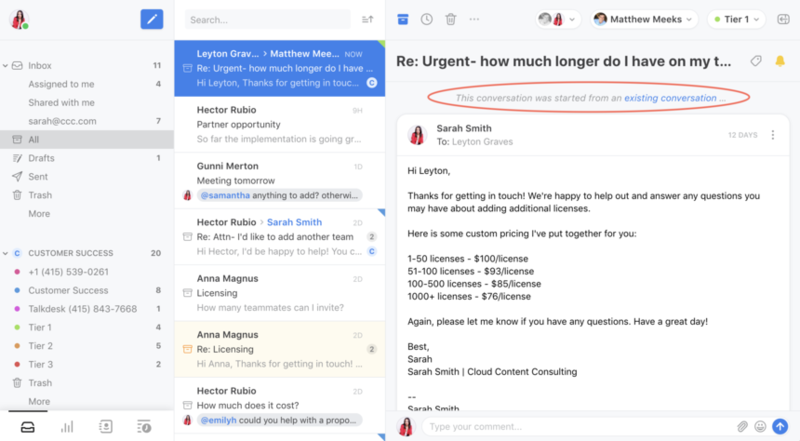 You can change the assignee, tags, or subject line of the new conversation without impacting the original conversation. When you move an email message, it's removed from its original conversation and used to start a new, separate conversation. Anyone with access to the original conversation can access the new one by a link in the conversation, unless it’s moved to an inbox they don't have access to or their access is revoked. The new conversation will have the same followers and assignee as the old conversation. If the original conversation was unassigned, the new conversation will be also unassigned. Tags and comments will remain on the original conversation and will not be moved. Moving messages is only visible to your Front team, not to the external recipients on the thread. To make it easier for them to keep topics separate, we recommend changing the subject line when you reply to the new conversation to something different from the original. If you are moving messages in a Gmail channel, your channel's threading mode is important. With Gmail threading, there is usually a 1:1 relationship between Front conversations and Gmail conversations. When you move a message, you create multiple Front threads for a single Gmail conversation. When you tag, archive, or delete one of the threads, the others can be tagged, archived, or deleted by mistake because Gmail syncs that action back to all of them. 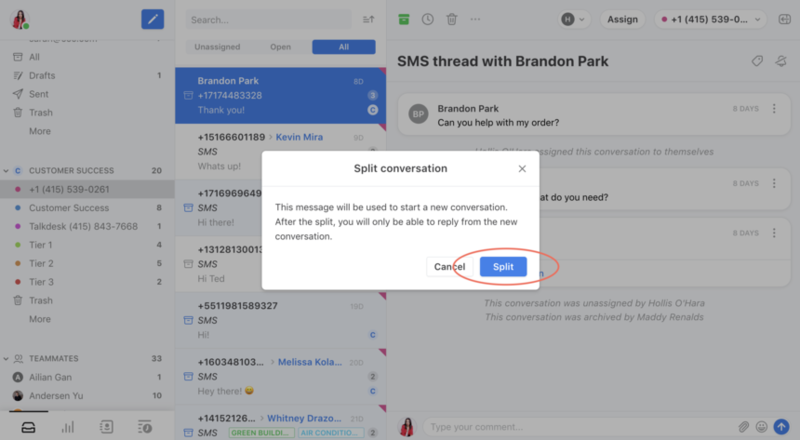 If you frequently use the "move message" feature, we suggest changing your threading mode to another option, which will disable the sync of archiving, deleting, and tagging with Gmail. All emails will continue to show up in both Front and Gmail so you can access them in both systems. 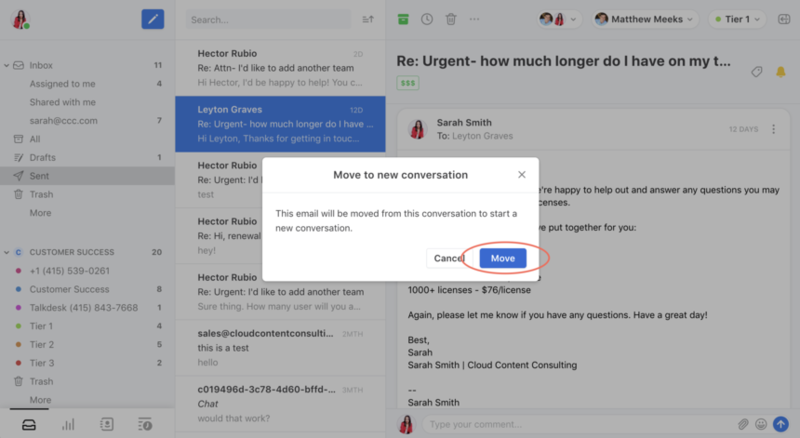 Any time a conversation thread includes a message To or From an Office 365 channel in Front, the option to move a message to a new conversation will not be possible. Without splitting, messages in SMS, Front Chat, Facebook, Intercom, and Smooch channels will continue in one long thread. This can make tagging very messy, as it’s hard to tell which part of the conversation a tag is referring to. When a customer starts chatting or texting about a completely new topic, you can split the conversation into a new thread with its own tag. That way, tag filtering and analytics stay clear and easy to understand. Open a conversation you want to split in an SMS, Front Chat, Facebook, Intercom, or Smooch channel. Select the message you want to use to start the new conversation. Click on Split conversation in the options menu for that message. Click Split in the popup menu to confirm you want to split the conversation. You’ll immediately move to a new conversation starting with your chosen message. If the message was not the last one in the conversation, any subsequent messages will be moved over also. Going forward, all messages to or from the contact will thread in the new conversation. You can assign or tag the old conversation and new conversation completely independently. You will only be able to reply from the new conversation. Use the link at the bottom of an old conversation to navigate to the latest thread to reply. Choose the message you want to use to start the new thread. Once you split it, all subsequent replies starting with that message will be moved over from their old conversation into the new one. The split will be invisible to the person you are chatting or texting with so your conversation appears continuous to them. Splitting a conversation is just a helpful way to stay organized in Front. 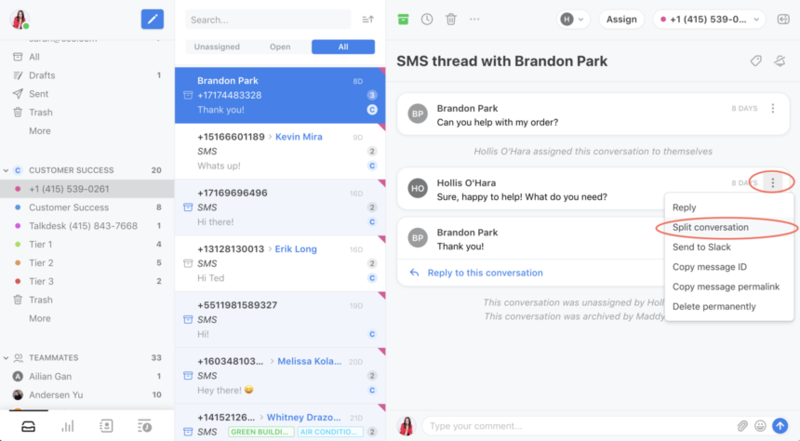 There will be activity lines in each conversation that link to each other, and anyone with access to the original conversation will have access to the new split conversation regardless of inbox permissions. You will not be able to reply to the old thread, and all new inbound messages from the contact will thread on the new conversation. The new conversation will have the same followers and assignee as the old one, and any comments on messages in the new conversation will also be moved. Tags and activities will not be ported over, but you can update tags in both conversations as needed after the split. Additionally, the new split conversation will be open, even if the old conversation was archived. You can split a conversation multiple times! For example, if you have a conversation with 10 messages, you can first split messages 4-10 into a new thread, then split messages 9-10 into another new thread. You’ll end up with 3 separate threads with your messages 1-3, 4-8, and 9-10. You must initiate a split with less than 50 subsequent messages. For example, in a thread with 500 messages that you want to split at message 250, you’d need to split out 400-500, 300-399, then 250-299. You can merge these threads afterwards if you want to end up with two conversations for messages 1-249 and 250-500. We will surface an error in the app if you try to split a conversation that would have more than 50 messages in the new thread. I absolutely love this feature! Thank you! Is there anything in the works to be able to move a message and all the ones following it into a new thread? Given this option wasn't available in the past, it would be nice to separate and clean up past threads as they reopen. Thanks! Is there a reason why this option only appears on certain emails? I am trying to start a new conversation and the option is not available in the drop down. Brooke Carlton What type of conversation are you trying to do this from? Currently it's only available for email conversations. Are you referring to a chat or SMS message perhaps?